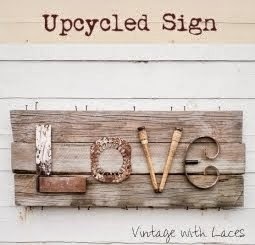 When the creative mind LISA over at tarnished and tattered announced the “Outside the Box” art challenge, I knew I would like to participate. The task was to alter a “Pure and Natural” soap box. The soaps of this company come in different shaped boxes and the one I got to play with was oblong and had a “window” that would just make a perfect picture frame. 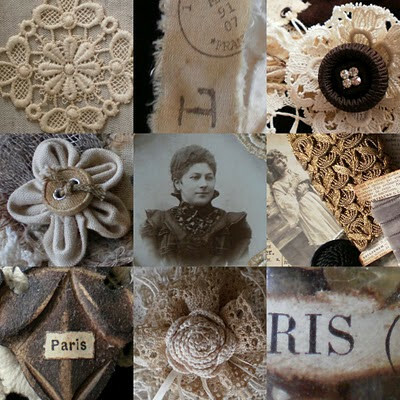 So my first thought was to use a lovely vintage photo, adhere old book pages to the box and add some pieces of lace and fabrics as well as some buttons. It was really tempting but would that have been a challenge for me? No, not really since these are the things I usually love to play with. Therefore I went through my stash of junk treasures, trying to come up with another idea. I picked a lot of different things, just to lay them aside pretty fast. 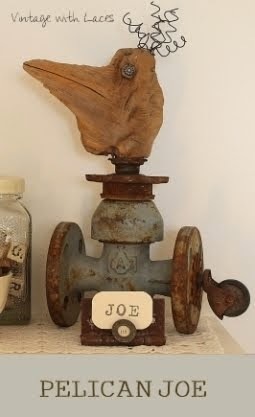 Then there was this doll head that seemed to reappear on my working table consistently and all of a sudden told me that it wanted to be “steampunked”. I got hooked on that idea and took out my small collection of watch parts, some nuts and a tiny screw wrench. First I had to prepare the the box though. I painted it black and then put a layer of gesso on, letting some black and bits of the original box color showing through. The doll head had a hole on top which inspired me to let something “grow” out of it and the first thing that came into my mind was a light bulb. I didn’t have such a small one that would have the typical shape but I had Christmas lights. I took one of those, removed the plastic part, cut off the lower glass end and filled it with tiniest watch parts I had. I added clear UTEE powder and heated it up with my heat gun, so that it would look like the parts are floating inside when cooled down. On top of it I put a screw. Unfortunately I couldn’t get any better pictures of it. I’m sorry! It had been lots of fun to participate in this challenge. Thank you, LISA for coming up with this great idea! Then I would like to share an amazing story with you that happened to me last year. Even though I think that coincidences can happen, this story must be something else because there were too many single incidences that led to something really amazing. I guess the odds for it are less than winning a lottery jackpot and thinking about it still gives me goosebumps. It all started on a sunny Sunday last May. You probably know what I love to do on sunny Sundays. Yes, I like to go to a flea market. On that Sunday there hadn't been one in the nearer vicinity and so we decided to drive to one that was in a town about an hour away. It was the first time ever that we went there. I found some pearl necklaces, a box filled with numbered tags and a few other things. When we left, we saw a sign that announced another flea market a few miles away. Of course we had to take a look there as well. Again I found a few nice things but nothing really spectacular. When I came back to the car, I saw hubby standing there, leafing through an album. As soon as he saw me approaching he hid it in a plastic bag and told me that this would be my anniversary gift. Even though I was curious, I was willing to wait the few days. Hubby in contrast can hardly ever wait to give me a gift and so some minutes later he gave me the album. He is so cute! 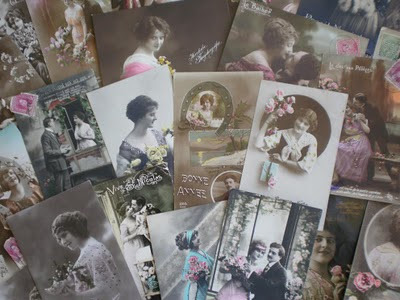 It was filled with over 20 beautiful postcards of women and couples. Hubby told me that he had bought it from a women (not a dealer) who had baby clothes and toys for sale and the album had been the only vintage thing on her table. He had almost missed it, especially since the album itself hadn't been neat or antique at all. I loved all the pretty postcards and had been very happy about this wonderful gift. All the cards had been adressed to a guy in Luxembourg, sent out to him not only national but also from Belgium, Germany and France. There is nothing amazing so far, I know, but the story isn't completed yet. Please stay with me for the second part. About two months later I had the sudden need for a vintage postcard of the Eiffel Tower. That was the first time ever I looked for one and I found one I liked in an auction and watched it. Then I checked out the seller's other auctions and there was a lot of 30 vintage postcards. They were hard to find for someone who was looking for such postcards because they were placed in a wrong category. Only a few of the postcards were shown and so I didn't really know what to expect. I placed a very low bid, so that I wouldn't be too disappointed in case I would win and the other postcards would be ugly. Some days later I had won not only the Eiffel Tower card but as well the lot and I got it for a song. I couldn't believe my luck when the postcards arrived and were even very pretty. When I turned the first one over to see who had been the receiver of the card, I froze and just couldn't believe my eyes. It was the SAME guy from Luxembourg who had received all the postcards my hubby had bought for me. Actually most of the cards were adressed to that guy. Now, how amazing ist that? As you can see, it had been highly unlikely that those two piles of postcards, once owned by the same guy, sold by different sellers about 90 years after they had been sent out, would end up in my studio but it happenend :-). Have a wonderful day, evening or night, dear friends, depending on where you are located! I'll be back soon to reveal more of the wonderful swaps I had participated in.